Honda Rebel Forum > Knuckle Busting | Repair | Modifications & Gear > Engine, Carburetor, Fuel System & Exhaust > Help w/moderate eng mods on the Honda 250 twin? Help w/moderate eng mods on the Honda 250 twin? Before I go too far, my intention is to find a 250 Nighthawk vs the Rebel I now have (if anyone is interested, I'm in N FL and will be heading to western NC in May. I didnt actually get the Reb for myself) and slightly modify it to fit the looks I prefer along w/some minor engine mods. I KNOW they are not powerhouses and wont be, and I know mods can affect reliability, but thats not an issue w/me for various reasons. I rebuilt the carb on my current Rebel and getting it on and off was the worse part. I LOVE the open/simple look of a clamp on air filter and no air box, so that is ONE mod I am most definitely interested in- no more fighting that rubber BOOT! Yes, I understand some jetting w/be necessary. Next up is the exhaust system which I do like the looks, but figure its really heavy and I know its restrictive. Heard one video with the baffles drilled out and it sounded fine- actually just about right to me, but still figure its really heavy. Of course Im guessing aftermkt pipes are very expensive, so its likely the stocker will have to stay- just opened up some. My last inherited Rebel had the 2-1 pipe which I didnt love. Im sure the long tube EMGO muffs would be lighter than the stockers but can anyone guess how much- or are the header pipes where a lot of the excess weight comes from due to Honda double wall steel?. After playing with the air intake and exhaust, the only other area that I would guess I could modify is the carb-maybe there is a Mikuni clone that works and would not break the bank? Will a slide carb make a noticeable difference here? I'm NOT into any internal engine changes like cam, compression, or increased bore. Hoping the members can chime in on starting points for the main and pilot jets. OK, basically I want to remove the air box/filter and use a GOOD pod, remove the exhaust baffles, and possibly install a Mikuni CLONE carb- If thats a reasonable and worthwhile addition to the other mods. Tell me, what is a Good pod? Current thinking is that a pod filter is more free-flowing, so you get less pressure differential between atmospheric and the peak delta in the venturi so that it doesn't draw as much fuel into the airstream compared to using the OEM filter. So most folks use the glutius maximus dynamometer and the art of the reading of the plug colors to approximate what main jet they need to change to. It would be great if removing a Rebel carb was easier. In comparison to many other models of motorcycle, it's actually easier. If a carb is clean, an inline filter is installed, and the carb is drained when not riding for extended periods, removing the boots shouldn't be needed. Adding a pod filter, which doesn't filter out dirt as well as the stock filter, will, as kryton has explained, require modifications. Most riders don't realize how much road grit the tires kick up. I wear white mesh pants and from the knees down, they get dirty quickly, even when riding exclusively on asphalt. Removing the air box will also eliminate the stock crankcase ventilitation system. 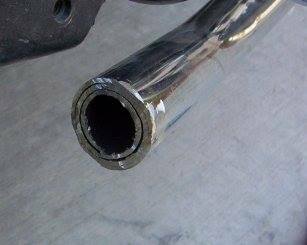 Most folks who go this route put a small pod filter on the crankcase breather tube. This results in oily goo collecting on the inside of the filter, where it can't be seen. If this gunk isn't removed before it blocks the filter, crankcase pressure will blow out the left side oil seal, which can lead to catastrophic engine damage. I rebuilt the carb on my current Rebel and getting it on and off was the worse part. I LOVE the open/simple look of a clamp on air filter and no air box, so that is ONE mod I am most definitely interested in- no more fighting that rubber BOOT! Yes, I understand some jetting w/be necessary. While the open/pod filter does have its aesthetic values, simply put too many folks have come and gone with this mod and most have complained about underwhelming performance citing top speeds of 55-65mph, something a stock Rebel is capable of in fourth gear. Positive crankcase ventilation is also an associated issue. A lot of them contested us on the matter but to date not a single one of them has stuck around long enough to post a long term report to prove us wrong. I even tried it once on an untitled 86 Reb --- you know, just so I wouldn't be another "inexperienced naysayer --- but ended up giving the project to a friend who subsequently had it stolen from him. Next up is the exhaust system which I do like the looks, but figure its really heavy and I know its restrictive. Heard one video with the baffles drilled out and it sounded fine- actually just about right to me, but still figure its really heavy. I realize the goal here is more power & less weight, the good ol' hot rod formula (and actual bobber formula, as opposed to the modern misinterpretation cited in my signature below ). My personal experience? Stock air box with baffled mufflers seems to work well. I don't have any before/after dyno figures though, but I'm happy with what I found works. Full systems, yes. However, trust me when I say this: you DO get what you pay for. so its likely the stocker will have to stay- just opened up some. That has worked well for me on a couple of Shadows. I have done the same on a Rebel but can not offer any reports on it as it is unfinished. My last inherited Rebel had the 2-1 pipe which I didnt love. Ideally an "all-into-one" system is the best system for an inline engine. Im sure the long tube EMGO muffs would be lighter than the stockers but can anyone guess how much- or are the header pipes where a lot of the excess weight comes from due to Honda double wall steel? After playing with the air intake and exhaust, the only other area that I would guess I could modify is the carb-maybe there is a Mikuni clone that works and would not break the bank? Will a slide carb make a noticeable difference here? I'm NOT into any internal engine changes like cam, compression, or increased bore. Hoping the members can chime in on starting points for the main and pilot jets. As I mentioned in the other thread, the CB250 Nighthawk already comes with a slightly larger carb than the Rebel has. After that there are dual carbs available on e-Bay, ranging from cheap Chinese to Asian/Australian marketed OEM duallies. I have the el-cheap-o twins and have not been impressed with their functionality so far. Either way, you'll need to acquire the dual carb intake boots and air box Y-connector, assuming the CB air box is similar to the Rebel's box (again, can't comment on this as mine did not come with an air box). Having a windshield mount break apart at speed cured me of being a windshield guy, so no comment there. FWIW a fly screen is not the same as a 1/4 fairing or bikini fairing. 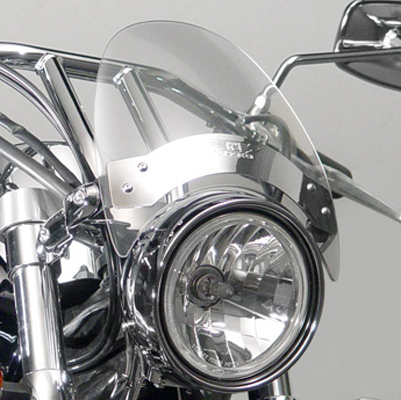 A fly screen is simply a micro-shield that mounts above the headlight, sans anything resembling fairing.